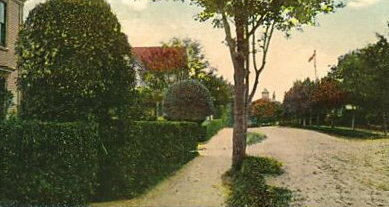 One of several different postcards produced in the early 1900s that showcased Yarmouth’s famous hedges, also known as “live fences”. Why does our romantic notion of a dream home typically include a white picket fence? It could be the result of inherited nostalgia or even a creation of Hollywood – but either way the vision seems to have widespread appeal. Most people view a white picket fence as an integral component of a picturesque property and one that adds a good deal of charm and order to a place. How can something as seemingly simple as a white picket fence assert so much elegance? Demystifying the allure of the white picket fence first requires a look at ourselves. I believe the human mind has an affinity for order; and, a white picket fence is a manifestation of order. Its stark white rails of uniform height and precision spacing pleases us with its cleanliness, form and predictable pattern. A fence also demands order by dictating where one may and may not walk. Additionally, a fence typically possesses one very likeable attribute – humility. What I mean by that is that as beautiful as a fence may be, it really doesn’t seek attention for itself; in fact, it nobly aspires to an existence of servitude. It exists to accentuate and compliment the structure that it encloses. Visually, a good fence does not compete with the associated house but draws the eyes upward. I am, so far talking exclusively about traditional white palings so I need to acknowledge a few other Nova Scotian fence traditions. Yarmouth’s live fences (or hedges) were stunning in their perfection – trimmed as close as a 4-H calf at Pro Show – they could if required keep the wandering beasts at bay. Earltown’s Bone Setter’s wall is one of many vestiges of old stone walls erected for the manifold purposes of clearing stone from fields, enclosing grazing animals and marking property lines. Bay of Fundy fishing weirs were simple yet ingenious devices that utilized the power of the tides to catch fish – once commonly stitched into the beaches of Fundy, their presence told of a way of life with a clarity no other type of fence could convey. Snake fences zigzagged their way through rural Nova Scotia many years ago and have entirely vanished apart from the odd suburban residence that displays one for artistic purposes. Dozens of other styles of board fences and iron fences were erected throughout the province with some of the latter still surviving in cemeteries and older residential areas. Historic photographs provide a wonderful opportunity for communities to document the style or styles of fences once associated with their local area. The diversity of style that existed from region to region and even from one town to the next was in many cases quite striking. Fences were but one of many built features that conveyed a sense of place but their ubiquity and design has largely been forgotten. The handsome new fence around the Chambers’ property is noticeable. The grounds are much improved in appearance by this neat and substantial enclosure, and King Street by its increased width and beautiful row of shade trees will soon become a favorite promenade. 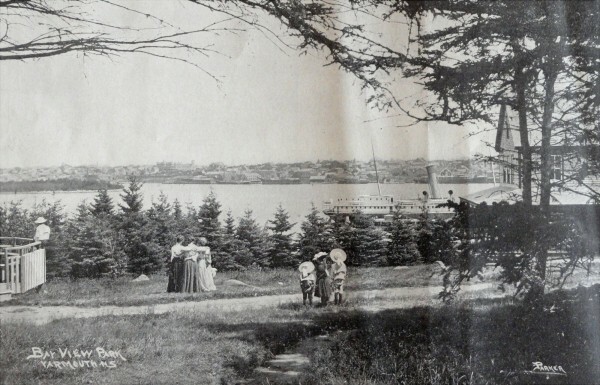 What led to the demise of Nova Scotia’s historic fences? Fashion. Changing tastes, between the years 1900 and 1910, began to favour unobstructed greenery over boarded enclosures. This meant that open lawns became the ideal and although hedges are a form of enclosure the fact that they are also greenery dictated that they remained in vogue. Unfortunately, no one had remembered to inform the livestock of these changes. So during the first decade of the twentieth century conflict reigned in Nova Scotia as livestock and their owners had to adjust to the new fashion. They were, of course, accustomed to moving through town streets with much the same effect as a golf ball in miniature golf – with barriers keeping them on the straight and narrow. Fewer fences meant an increase in complaints of cows destroying front yards on their way from one grazing ground to another. Demands for better supervision of livestock were made and eventually more men and boys provided it. As herd boys demonstrated their diligence, still more home owners dismantled their fences. So in the end, fashion, and to some degree better bovine management, sounded the death knell for fences. The swinging pendulum of fashion though may once again be calling for a renaissance. Historic Nova Scotian fences are much too attractive to allow them to remain forgotten. So, consider a fence for your home, especially if it is a heritage home and try to avoid the generic pre-assembled styles available at home reno stores. For more on historic fences, and particularly the unique fences of Truro, see Joe Ballard’s articles, in the Winter 2011-12 edition of the Griffin – a quarterly publication of the Heritage Trust of Nova Scotia and also Edifice Old Home Magazine, issue 22, 2009. This is the forest primeval. The murmuring pines and the hemlocks, bearded with moss, and in garments green, indistinct in the twilight, stand like Druids of eld, with voices sad and prophetic. Historic landscapes are an often overlooked part of our cultural heritage. While it may be easy for the general public to recognize a historic landscape such as Grand-Pré, the public only understands the importance of such a site because of the extensive interpretation and pervasive education that mark it as significant (and because of the unrelenting heart of Gabriel Lajeunesse). What of those sites that do not yet benefit from the protecting cloak of site interpretation and public education? What of traditional Mi’kmaq flintknapping sites? What of the stone and iron work in historic cemeteries? What of sites where public hangings took place? Or of individual trees or rocks that once held a place of cultural meaning in local lore? Parks, bridges, canals, commons, roads, dykes, sports fields, and other “built” landscapes can be so ubiquitous that we almost don’t recognize their significance. Sometimes it takes someone from “away” to point out the uniqueness of a place. Sometimes a place can appear to be so unchanging, so constant, that locals do not fear it losing its heritage value. Heritage value though is not always eradicated by an early morning excavator; it can also be forfeited slowly over generations. By now you are beginning to get an inkling of where this commentary is headed. Everything should be turned into a museum so that history huggers have a place to take (and indoctrinate) their children. Nope! Turning everything into a museum is of course not the answer; nor is it the objective of those engaged in historic preservation. It is in fact, ‘continuous use’ that is often the best preserver of all. It is important though that sites are thoroughly researched and documented and appropriate management plans put in place. The ongoing preservation of cultural landscapes provides scenic, economic, recreational, ecological, and educational opportunities for Nova Scotians and visitors. Such sites provided early residents with a sense of place and have the ability to continue doing so for many years to come.